Watch me in action on my Instagram here! Sorry for the delay on this post! For those of you that followed my Facebook Holiday Baking Contest, these are the recipes that inspired me! I would highly recommend all of them except potentially the shortbread (might have been my error in how I mixed the butter). They are great base recipes so feel free to give them your own little twists and flavours. TheSimmeringPot approved and tested! 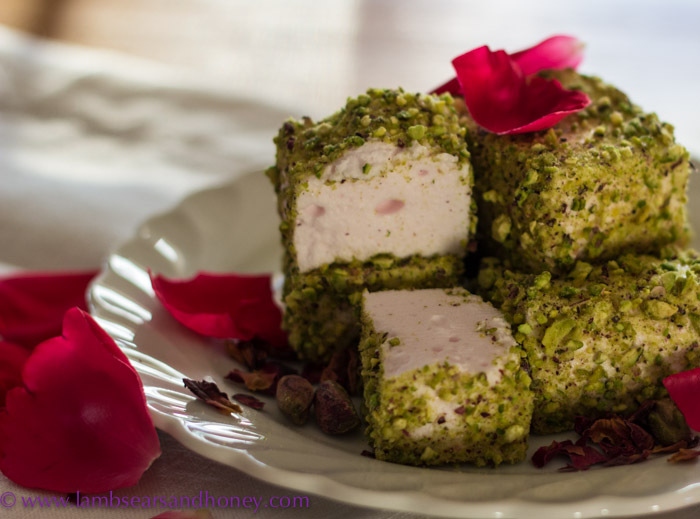 1) Rosewater and pistachio pink marshmallows! The main image for this post comes from lambsearsandhoney.com, go check out their site for lots of great recipes! I wanted to make some fresh marshmallows for my holiday contest because I’d never made them before and because you can make them any flavour you’d like! Check out the recipe HERE. I stayed true to the recipe except I used some rose coloured food gel instead of food colouring drops. I find gels are better overall. Once these marshmallows are whipped and you’re letting them set, they can be a bit sticky. Roll them in pistachios or a mixture of powdered sugar and nuts. They absorb moisture from the air so putting them in a sealed container is a good idea! 2) Butter tarts with cranberries and pecans! This recipe comes from mytinyoven.blogspot.ca. I used the skeleton of this recipe and I liked how the filling puffed up in the oven. Store-bought mini-tart shells worked great with these, just follow the 12-15 minute recommended bake-time for this recipe. There are a lot of raisin haters out there so I opted to make these butter tarts with cranberries and pecans instead to make it more ‘holiday’-ish. I may have eaten a few of these myself 😛 Check out the full recipe here! 3) Candy cane French Macarons! I have used this recipe a couple of times now and it really is foolproof! When I first started making macarons, I probably tried four or five different recipes with varying degrees of success. This has worked every time so I highly recommend it, thank you Beth! entertainingwithbeth.com is a great food blog, check her out! For these pretty pink macarons, I used the same rose gel colouring. I added a couple of drops of mint oil (which is incredibly potent) to the batter to give that candy cane essence. I made a simple cream cheese frosting to sandwich the macarons once they were cooled and sprinkled crushed up candy canes on them because why not? Follow this recipe to a T and it’ll work, it’s here! 4) Shortbread with dark chocolate drizzles! These were cake-like and moist. I loved them. I ate one fresh out of the oven and it was so light and delicious. The recipe is here and I will definitely be making them again. I used the same simple cream cheese frosting for these sandwich cookies. You can adjust the spices. I tend to go a bit heavier on the nutmeg and cloves. These were one of the most popular things from the holiday baking contest. They received a lot of positive feedback so it’s a keeper! I stayed pretty true to this recipe but I would recommend using white chocolate that isn’t too sweet. I also used my Microplane to grate fresh nutmeg which makes a big difference; it really gives the essence of eggnog. I put a little silver sugarball to make it a bit fancier. The full recipe can be found here!